A large steelhead summers over in the Little Sur River downstream of the Pico Blanco Boy Scout Camp. 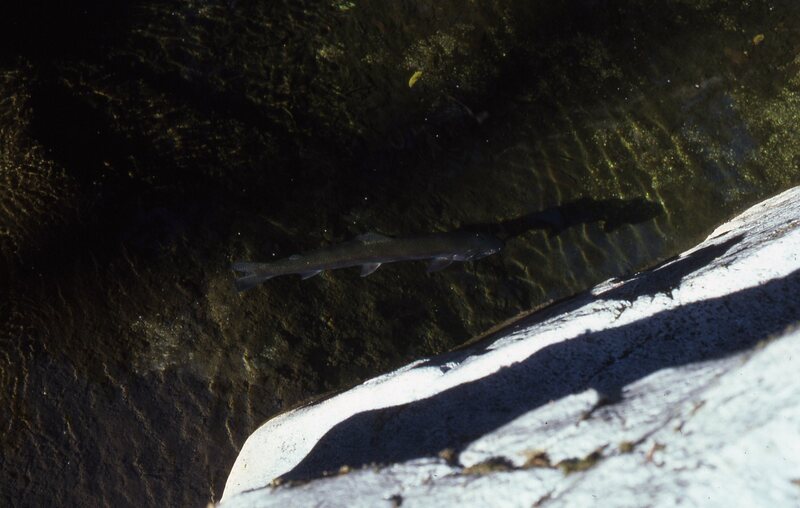 Dozens of endangered fish like this one were killed in 2002 (and quite probably in other years as well) by camp operators who apparently felt that getting their lake filled quickly was more important than keeping the fish alive. The San Francisco Chronicle has been running a series of investigative articles taking the Boy Scouts of America to task for logging and otherwise despoiling lands granted to them for preservation. Not a surprise to those of us who were sickened by the logging of old growth redwood and douglas fir at the Pico Blanco Boy Scout Camp some years back – a camp donated to the scouts by Hearst, let’s not forget, for conservation purposes. But today’s article is about the 2002 Pico Blanco Boy Scout Camp Steelhead Massacre. A valuable cautionary tale illustrating how mindless arrogance and the right political connections can trump, not just our common interest in keeping a remarkable and iconic fish alive, but also common sense and the equal (i.e. fair) application of the law. This entry was posted on Sunday, February 1st, 2009 at 4:17 pm and is filed under Big Sur, History, Politics, Santa Lucias. You can follow any responses to this entry through the RSS 2.0 feed. You can leave a response, or trackback from your own site. I am a 30 year veteran scouter (former BSA executive). I have about fifteen summers of camp service and I am an Eagle Scout. But my opinion on this might not be what you expect. In 1949, my family – which now owns no property at all, not even a house – donated more than 100 acres in the Stanislaus National Forest near Avery, Ca to the Boy Scouts. The terms of the deed – now conveniently lost – stated that the BSA was to use the property for youth activities and other charity-related work forever. This was according to my late grandfather. Yet by 1989, afer I had spent three summers working on the property (formerly called Rancho Paradiso and Camp 49er by the BSA), the local council sold the property to developers in order to cover debt accrued in building a new office building is Stockton (they don’t own that anymore either). The volunteers were angry – but no one with any power said a word – despite the fact that another 160 acres had just been deeded by the USFS. It took more than 10 years for the land to sit before they started building luxury houses on 5+ acre lots because of the risk involved in violating federal land use rules. Oh, BTW – what happened to the Scout Executive who sold the camp? He became the Chief Scout Executive last year. So, while I love Scouting and I believe in residence camping. The BSA and all other organizations need to be accountable. Especially when their own Outdoor Code is violated as well. Do you know how long ago or when this logging took place? Nice website, btw, very informative. Hard to remember exactly, but seems like it must have been the late ’80s or early ’90s when we walked through the camp and were shocked to see that the scouts were cutting some of their finest landmark trees. Jeff Norman, who followed this issue more closely than anyone and could have given you a precise answer about how much logging took place, and in what years, is unfortunately deceased.